Solar-Panel-Tester for measurements of solar panels / for measurement on grid-connected photovoltaic systems / with DIN VDE 0126-23 / EN622446:2009 / up to 1000 V / 20 A DC max. 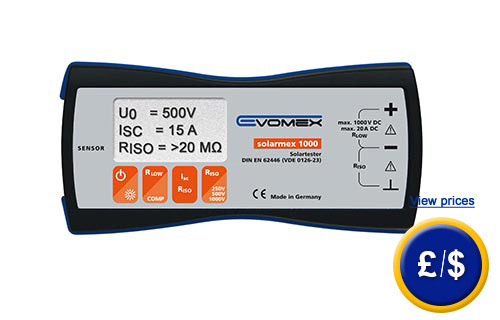 The solar-panel-tester Solarmex 1000 by Evomex is used for the testing of photovoltaic systems. The solar-panel-tester measures the open-circuit-voltage and the short-circuit-current of solar panels. Besides these functions, the solar-panel-tester Solarmex 1000 disposes of a polarity-testing of solar panels. At this, the tester checks weather all the solar panels in the string are correctly connected. An isolation-testing can be taken with this instrument as well. Especially the isolation-testing of solar-strings is no problem for the solar-panel-tester Solarmex 1000. With this solar-panel-tester, you can also take isolation-tests on any other electrical systems. The solar-panel-tester works with DIN VDE 0126-23. If you have further questions concerning the solar-panel-tester, take a look at the following technical data or call our hotline: UK customers +44(0) 23 809 870 30 / US customers +1-410-387-7703. Our technicians and engineers would be pleased to inform you concerning the solar-panel-tester and all other products in terms of regulation and control or scales and balances by PCE Instruments.